This year's conference engaged committed change makers and thought leaders: farmers, chefs, scientists and activists who are committed to a more just and sustainable food system. Select sessions are available now on our website, Facebook, and YouTube! Select sessions are available to watch now. The lottery application for the 2018 Young Farmers Conference is closed. Sign up to be notified when the 2019 lottery opens! Four Stone Barns Fellows discuss equality in the food system. Ricardo Salvador and Marcia DeLonge of the Union for Concerned Scientists discuss a way forward for agriculture. Indigenous Agriculture and themes of public health through native cooking demonstrations. Discussing and demonstrating several new tools developed as a direct result of collaboration with Eliot Coleman and the Slow Tools Group. Moving beyond statistics to explore the significance of women in leadership roles in agriculture and opportunities for progress. A thought-provoking keynote by M. Sanjayan, a global conservation scientist and CEO of Conservation International. The Young Farmers Conference was presented with support from generous sponsors and partners. 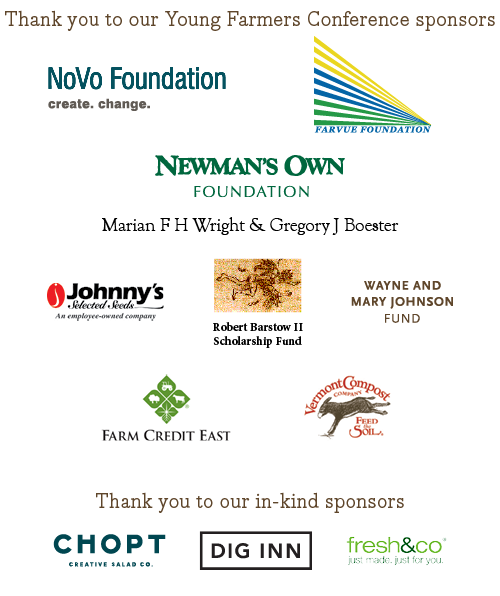 For information about 2018 sponsorship opportunities, please contact Maggie Nolin at maggien@stonebarnscenter.org. We work to train the next generation of farmers and grow more food changemakers. Help us in our mission to change the way America eats and farms.